Education is the very basis of human empowerment. It is an incredibly powerful tool by which humans engineer their future. It is by education, that we shape up our lives and the lives of people around us. However, not everyone is blessed with an education in their student life, that provides a successful career to the individual going ahead. Only a handful of people can claim to have an education that has really paid them off. Many people despite of studying with sincerity, fail to make a mark on the result front. This is because, their negative karmic structure from their past lives is so strong that it poses hurdles in the education domain of their life. Nobody desires for an education that would only provide survival and does not really provide anything significant in terms of career growth. So, what makes a person acquire an education that proves to be way more than just a means of survival in his/her life to come? The answer is: Blessings of Goddess Saraswati! Goddess Saraswati is the divine form of Mother Almighty that blesses us with education, intelligence and wisdom. It is by the blessings of Goddess Saraswati that a student gets the necessary intellect and aptitude to successfully acquire an education that would attract opportunities of growth and prosperity in his/her life. If a person manages to please Goddess Saraswati, then intelligence and a successful education will be a natural consequence in his/her life. So, how can one please the divine Goddess Saraswati to have a rewarding education in life? Simple, by a Saraswati Puja! Saraswati Puja is a holy ritual that pleases Goddess Saraswati, resulting in Her powerful blessings upon the native. Hence, we urge you to book a Saraswati Puja for yourself, to receive the blessings of Goddess Saraswati and enjoy abundance of intelligence and a rewarding academic career in life! Saraswati Puja gives the individual success in his/her educational career. By Saraswati Puja, a person gets enhanced focus and concentration in education. Saraswati Puja creates an aura of wisdom around the native. Saraswati Puja attracts energies that increase the power of perception in an individual. 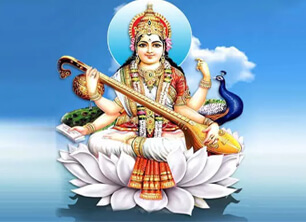 Saraswati Puja opens the doorway of growth opportunities based on the education of a native and helps the native in getting a job that would take his/her career to great heights. Saraswati Puja favours the chances of promotions and skill based appraisals in an individual's career. Saraswati Puja helps the native in attaining a sound and balanced state of mind. Saraswati Puja gives the necessary insight to identify lucrative avenues of investment at the right time in life. It also promotes the prospects of foreign education in one's life. Saraswati Puja on your behalf by highly learned Brahmin Priests to bring forth the divine blessings of Goddess Saraswati in your life. Note: The Saraswati Puja is performed in strict accordance with all Vedic rules & rituals as prescribed in the Holy Scriptures. Why should I go for Saraswati Puja? Goddess Saraswati is the Goddess of intelligence & wisdom, therefore, Her blessings would pave the way of success in the educational domain of your life. So, go for this life altering ritual! Who will perform the Saraswati Puja? Absolutely, you can watch the Saraswati Puja being performed in your name via a recording provided to you by us. Is there any minimum age to go for Saraswati Puja? No. Anyone can go for this Saraswati Puja. Can I book the Saraswati Puja for someone else in my family? Absolutely! What better gift can you give to your near and dear ones, especially students than making sure that they get the blessings of Goddess Saraswati!